Deirdre McAuliffe is up next! Deirdre, who is Irish but currently living in Hampshire, UK, is one of the younger participants that we've had. Despite the fact that she is very new to running and to international travel, it turns out that she's a natural at both activities. I ran a little in school at sports days and such. However, I fell out of the routine in teenage years and decided on a whim to enter a half marathon in 2014 - having done little to no training! On that very, very, very long and slow run, I decided that I quite liked the idea of running! I have since done a few half marathons in Ireland and UK and completed my first marathon in Dublin in 2016. After that first half marathon in Dingle, I saw an advertisement for Rogue Expeditions on the race's Facebook page. I promised myself that if I kept this running madness up, I would treat myself once I'd finished university! Lots! Until this trip, I had never traveled outside of Europe. I had also never traveled on my own. Like many others, I was worried about the mileage and also the terrain as I had never run on trails. I knew this was going to be a whole new experience but Allison was very informative from the initial stages so I felt as comfortable as possible about the trip. I didn't know anyone in the group beforehand but I was blown away by the kindness of everyone I met. From the airport welcome with a bottle of water to the parting hugs, I couldn't have met a nicer bunch of people. The cooks and drivers were fantastic! Always prepared with water and snacks, and the most elaborate picnics you could imagine. 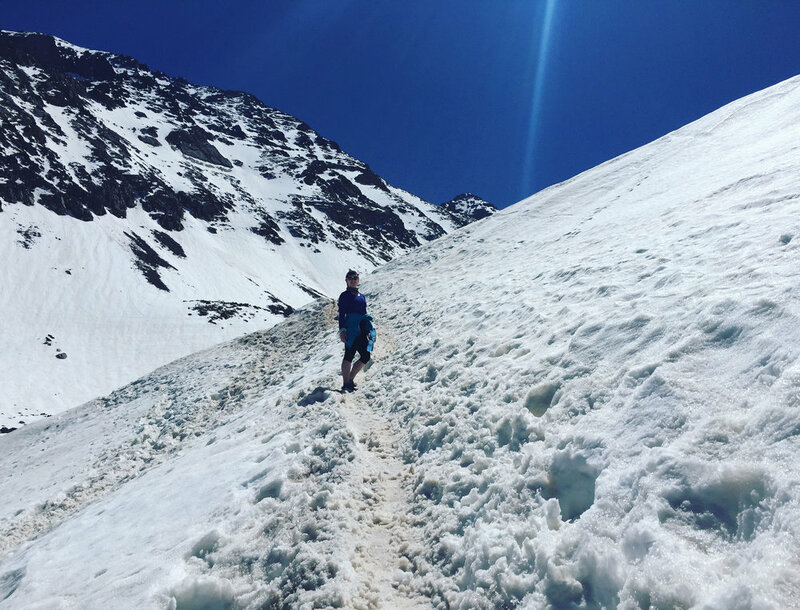 My favourite run has to be the run and hike up to the base camp of Mount Toubkal. It was my first experience of many things - trails, running in the snow and higher altitudes. It was also the most challenging but I always felt that I could plod along at my own pace and enjoy it. It's got to be the Beef Kefta tagine served up hot by our wonderful team of cooks after that very long hike up Mount Toubkal. The food across the entire trip was outstanding - always fresh, always varied and catered for a very diverse group of very hungry runners without an issue. Apart from my highest mileage week to date, there wasn't one! The hospitality for sure. From the drivers and cooks who knew us by name by the second day. To the staff in the places we stayed who met us with warm handshakes. To the remote villages where people's livelihoods are their goats, crops and the occasional cow. Everyone I met on this trip had a warm smile. They call out "Bonjour!" as you pass and the children wave and giggle. I even had a group of children follow me for 1.5 miles through a tiny village and onto our picnic. The races I've been to have the same sense of excitement beforehand. However, there's so much pressure to perform "on the day", worrying about baggage, food and organising where to meet family and friends afterwards. Those pressures are removed during this trip. You just need to get yourself to the airport and you're looked after by a fantastic crew from the moment you land, to the farewell at the airport. They are so good at what they do - Allison, James and Hamid really do a wonderful job and make it look effortless. Several times during the trip, I found myself standing somewhere utterly beautiful with my mouth half open in amazement, coming to terms with how lucky I am to have had a place on this trip.